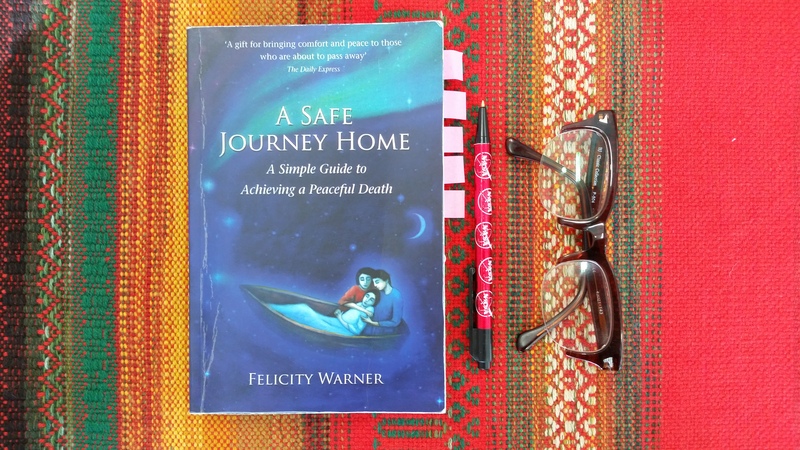 I’ve just finished reading Felicity Warner’s beautiful book ‘A Safe Journey Home – A Simple Guide To Achieving a Peaceful Death’. It’s full to the brim with practical and spiritual advice on how to ease the passage of the dying. Felicity Warner pioneered the Soul Midwife movement. Soul Midwives are “holistic and spiritual companions to anyone at the end of life”. They use traditional skills to ensure that death is a dignified and peaceful experience. The book itself works as a step by step guide to help those sitting with the dying (or ‘friends’ as Soul Midwives refer to them as) create a loving, warm and safe atmosphere in which to pass the final days and hours. The book covers a variety of spiritual and holistic techniques but encourages you to use only what feels appropriate within your own traditions and beliefs. For the cynics out there (myself included) this is not a ‘new age’ manual. At its core it is practical, solid and relatable advice peppered with incredibly moving personal accounts and useful mantras. The section on looking after yourself is very transferable and I feel it could really benefit all of those who find themselves with low energy and fatigue due to modern pressures and stress. From reading this book I have gained a better understanding of the physical and mental process of dying and how to alleviate death related anxiety and pain through simple and traditional techniques. Not only do I feel more prepared for the death of a loved one but I feel more prepared for my own death. It has also taught me how to increase my own sense of peace and well-being and I have already incorporated this into my daily life. If a loved one is struggling with terminal illness, read this book. If you or someone you know is scared of death, read this book. If you want to feel prepared and comforted in the face of death, read this book. I truly believe everyone could benefit from having this book to hand. I will definitely be passing it on to friends and family. You can get a copy of ‘A Safe Journey Home’ here. I love your website. Death and the surrounding subject it is so frequently brushed under the carpet and not openly discussed. It’s great to see a website tackling it in a natural, open and respectful manner. I had a friend die a few years ago of cancer and felt pure anger and destruction for some time after. I felt I was alone with these feelings.